The $39.3 million from CAP will produce another $28.4 in industry funding from industry groups. Ottawa—Farm groups across the country welcomed an announcement of up to $39.3 million in funding from the Canadian Agriculture Partnership for crop research that will attract an additional $28.4 million in support from industry groups. The Wheat Cluster, led by the Canadian Wheat Research Coalition, will receive $13.9 million to encourage higher-yielding varieties including the next generation of Fusarium Head Blight resistant varieties. The Diverse Field Crop Cluster, led by Ag-West Bio, will get $13.7 million to focus on variety development, crop protection, production agronomy and value added practices to support diverse crop growth. The Barley Cluster, led by the Barley Council of Canada, will receive $6.3 million to improve productivity in the science and technology of using barley for food and increase disease resistance. The Soybean Cluster, led by the Canadian Field Crop Research Alliance (CFCRA), will get $5.4 million for more resilient and productive varieties that increase the geographic range for growing crops and benefit the environment. The CFCRA is a not-for-profit entity founded in 2010 with an interest in advancing the genetic capacity of field crops in Canada, particularly soybean, corn, wheat, barley, and oats. 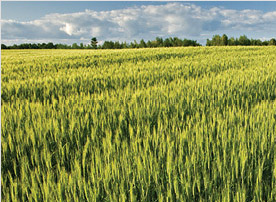 The CFCRA is comprised of provincial farm organizations and industry partners, including: Atlantic Grains Council, Grain Farmers of Ontario; Producteurs de grains du Québec; Manitoba Pulse & Soybean Growers; Manitoba Corn Growers Association; Saskatchewan Pulse Growers; Prairie Oat Growers Association; SeCan Association; and FP Genetics. Soy Canada hopes to see a doubling of soybean production in the next decade after a 103 per cent increase during the past decade. Soybeans are now Canada’s third most valuable field crop after canola and wheat and soybeans and soy products were exported to 71 countries in 2017. The research will aim for new varieties that could better resist Prairie heat and drought stress, new biotechnology tools that will strengthen wheat breeding, and an innovative winter wheat agronomic package aimed at improving sustainability on the Canadian prairies, among a host of other high value projects, he said. Serge Buy, Executive Director of the Agricultural Institute of Canada (AIC), said the money in the four crop clusters “enable research into agriculture to continue and get the sector to reach new goals. In hopes of boosting collaboration, AIC aims to hold a conference for the cluster researchers in Ottawa in May, he said.